Martial Views: What's 'Your' Kata? When I used to go out to compete, I was also a spectator. Most competitors leave right after their matches, but I would stick around to get some ideas. The black belt kata competition would fascinate me, especially the advanced black belts (3rd and 4th dan). Some of the renditions of kata you'll see at this level can be very inspiring. At some point we can figure out which kata we like to do. I had an instructor who would say, "there's white belt kata, there's black belt kata, and then there's your kata." But why do we like some forms and not others? Not that we should slack off on the kata that we think give us trouble (remember the Zen saying "the obstacle is the path"), but there's probably one you believe is best suited for you. This is true for a variety of reasons, including your level of athleticism and personality. Seiuchin. This is a powerful karate form that comes from Goju-ryu. 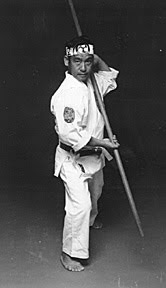 Features wide and deep shiko-dachi stance with plenty of angles and forceful breathing techniques. This ancient kata finishes with a corkscrew punch - peculiar to the Isshinryu system. Kusanku. An aesthetic, challenging and beautiful karate form. I never had the nerve to compete with Kusanku. The truth is, you really need to be a certain body type to pull it off, at least for a tournament. I've seen a couple of entries butcher this one. If you have a large frame or lack a degree of flexibility, the jumping crescent kick halfway through this form may lack the finesse the judges are looking for. Chatan Yara no sai. The sai (tri-pronged truncheon) is probably the only weapon found in Okinawan kobudo that didn't originally start off as a farming implement. The sai appears to have been developed to counter larger weapons, like the bo (long staff) and especially the sword. One reason I like the sai is because some of the techniques mimic what the hands would do in karate. If you really like the sai I would recommend getting a quality pair (like Shureido) as they are well balanced and can be handled easily. It used to be held that every kata was the distilled essence of a fighting system. Maybe this is why the old-time masters would spend months and even years drilling their charges on a single form. Certainly they had their preferences: Choki Motobu is always depicted performing Naihanchi. Chojun Miyagi (and many others) felt that the kata Sanchin was of utmost importance. What kata do you feel personifies you? Why? What kata do you feel personifies you? Seiuchin, Wansu, and Sunsu; Sanchin as exercise. Seuichin because like the Wansu kata speak to me. What I mean is when I practice them they tend to create a rhythm and in that rhythm bunkai is inspired so it allows me to implement and use visualization that actually applies to me and self protective endeavors. Of all the kata these two seem to fit me and are the most natural when performing, i.e. my body seems to flow and follow the kata. When I step into the "honto" version and then the "chaotic" version for self protection they come naturally, with out effort, which to me is important as the adrenaline dump that always occurs in violent situations this tells me that my ability to pull them up, use them, regardless of the dumps effects I will have a "fighting chance." Sunsu is also fitting to this why of kata favorites but it also is the creation of the Isshinryu system and creator thus has special meaning to me personally and it is just my luck it speaks to me as well allowing me to draw from it and create from it. I still practice the other empty hand kata as they are "empty hand" which I feel are critically more important than the pleasure of weapons training which I do not believe are beneficial to my empty hand practice. That is just me so remember this is my standpoint and has nothing to do with traditional Isshinryu practice but a more creative practice for me. After all, it all depends on your "Personal Philosophy of Karate-do" along with your strategy which of course dictates your tactics, etc. Thanks for this posting Vesia Sensei, really great! Well, I hate to say this but the traditionalists are going to balk at this but my main katas are the open forms that I self choreographed for competition. These are forms which have the level of difficulty I'm comfortable with, the techniques that I want to show to both the judges and the audience and what fits my own body at my age. I'm very fond of Seiuchin, but my absolute favorite kata are Wansu, Chinto, and Urashi Bo. Wansu and Chinto both have a flow and rhythm that I find very appealing, almost as much dance as kata, while Urashi Bo has taught me an immense amount about power and focus (plus I just love my bo). I train Kimura Shukokai and have a personal preference for Jiin Kata, initially it was because it took me a year to master it when going for my purple belt, afterwards i found that it was the combination of stillness and powerful movements expresses my understanding of self-defence. Sabum used to say that your form is not my form. I think he was saying the same thing your instructor was saying. I'm going to break with the karate thread and opine about Tae Kwon Do. The ones I still practice despite having "retired" from TKD have techniques that I think could really work. I do practice Il through Taebek (this one is still rough). I've given up on Keumgang because I think it's a waste of time. Lately I've played a new game: Stop at a random point in the form and see what I go do from a kung fu, quasi wing chun, or street perspective. It's a good educational tool and keeps solo practice fresh! My style is Shorin-ryu and my Kobudo is also Chatanyara no sai. I prefer it to the bo, but for competition in the future, I'm likely going to be focusing on Sakugawa no kon. I find both sai and bo improve kata performance, because they stress similar muscle groups.